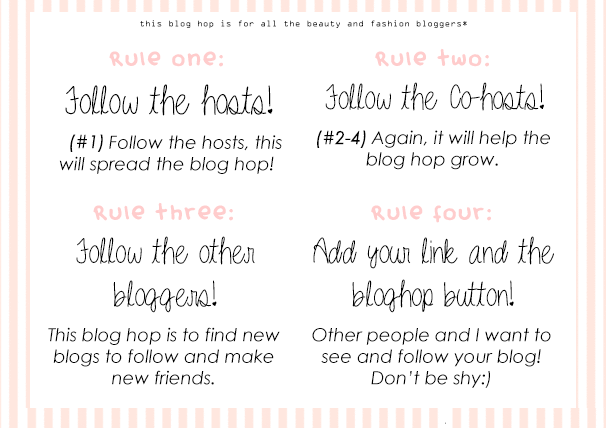 Welcome to the fourth Beauty and Fashion Bloggers' Blog Hop ♡ This hop has been a long time coming. It is dedicated to all the beauty and fashion bloggers who meet each other and to bind our beauty and fashion blogging community. This hop lets you find new blogs to follow, help you get new followers / exposure, and make new friends. I am your host, Laila, and I hope you join us every Saturday. All Beauty and Fashion Bloggers' Bloghop start at US Eastern Time of 12 am on Saturday. Add your link and start visiting/following other bloggers (follow the rules of course)! 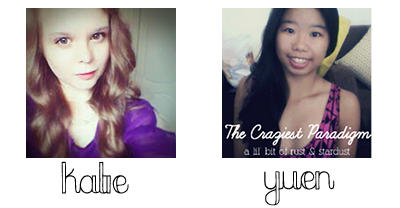 Here our lovely co-hosts of the week! I DO NOTICE THE PEOPLE WHO DON'T FOLLOW STEP ONE AND TWO BEFORE ADDING THEIR LINKS. IT ONLY HURTS YOU AS A BLOGGER! If you are interested in co-hosting with me, please email me (found in the contact page)! Please say your blog link and have at least 150 blog followers. I love how you do blog hops like these ^.^ Its a really good way to find new bloggers. btw, I am hosting an international giveaway on my blog, feel free to join. Thanks for this blog hop. I followed all the rules above. Please follow back. Thank you ms. Strawberry:) I am very happy you like it! Eid Mubarak | Makeup, Clothes, and Henna!